The realities of pain and suffering can easily push you to the point of questioning whether or not God truly cares. Even though He promised to work all things together for good, sometimes it can seem as if that's never going to happen. In God's Mysterious Ways, Gary Inrig examines the Old Testament story of Joseph, one of the most insightful examples of divine care. Seeing the twists and turns of Joseph's life intertwined with the sovereignty of God, you'll understand how God worked not only through the faithfulness of Joseph, but also through the sinfulness of Joseph's brothers. Speaking to those who see or experience suffering, this book offers a message of grace. It's a gentle reminder that, no matter what your circumstances seem to tell you, God's will prevails-His purposes can be trusted and His promises never fail. 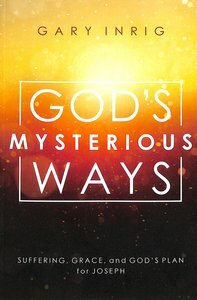 About "God's Mysterious Ways: Suffering, Grace, and God's Plan For Joseph"
Inrig is a graduate of the University of British Columbia and Dallas Theological Seminary. He is pastor of Trinity Evangelical Free Church in Redlands, California.